The chasm that exists between the newsroom and advertising departments is as old as time. Few things bridge the gap. But messaging app Slack comes close. Slack rooms, bots, or channels ultimately are built around conversations – and efficiency. And as much as Slack is simple, it can get pretty complicated. Already, the platform has been adopted and folded into the work flow of many news organizations, including Vox Media and Fusion. Most use Slack bots to aid editorial operations, including publishing, editing, and moving stories along. Poynter reported Al Jazeera English recently joined the Slack bandwagon. The news agency listens to breaking news through Slack notifications. Fusion similarly uses Slack for editorial and production, utilizing both private and public rooms and allowing other teams to see what colleagues are working on. News organizations that use Slack do so over several channels, mostly for departments, between offices, and to foster communication and pull together teams. Slack seems to check all of the boxes for news agencies: Instant messaging, no more email threads, drag and drop important material, instant feedback on stories, public and private conversations and/or channels, and if you’re working on other things – you get pinged when you’re needed. Everything is searchable, including messages and files. Files that can be shared through Slack run the gamut, including images, PDFs, documents, and spreadsheets. It’s literally as simple as dragging and dropping files into the proper channel. Slack’s success thus far also has translated into growth for the company. Slack employees number at more than 250, says Stephanie Matchung, with Rsquared Communication, on behalf of Slack. Nieman Lab reports that Slack, despite being just two years old, already has collected $340 million in capital and now is valued at $2.8 billion. Matchung reports Slack’s annual recurring revenue is $35 million. The app also has more than 1.25 million daily active users, as of Aug. 2015 figures. Here’s a video on getting started with the app. “Slack is a new kind of messaging for teams, bringing all your communication together in one simple place and integrating with the tools you already use,” the video says. 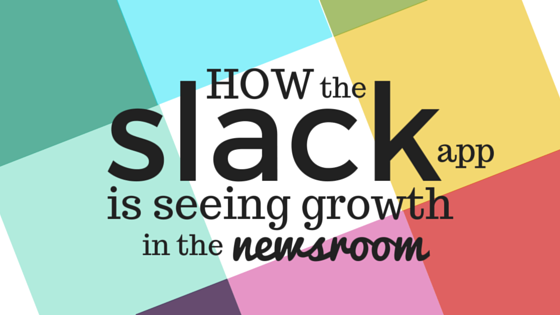 Need some testimonials on how people and businesses – including newsrooms – are using Slack? Find them on SlackHQ on Flipboard. And, if you’re looking to try this out, here’s where you should start: A Beginner’s Guide to Your First Bot. Some popular newsroom conversations that have come to light include #data, #conference, #development, #whereabouts, #cute, and #breaking-news. ReadWrite recently published some good pieces – Slack Aims To Help Other Apps, Not Compete With Them and For Slack’s App Builders, The Message Is The Platform.